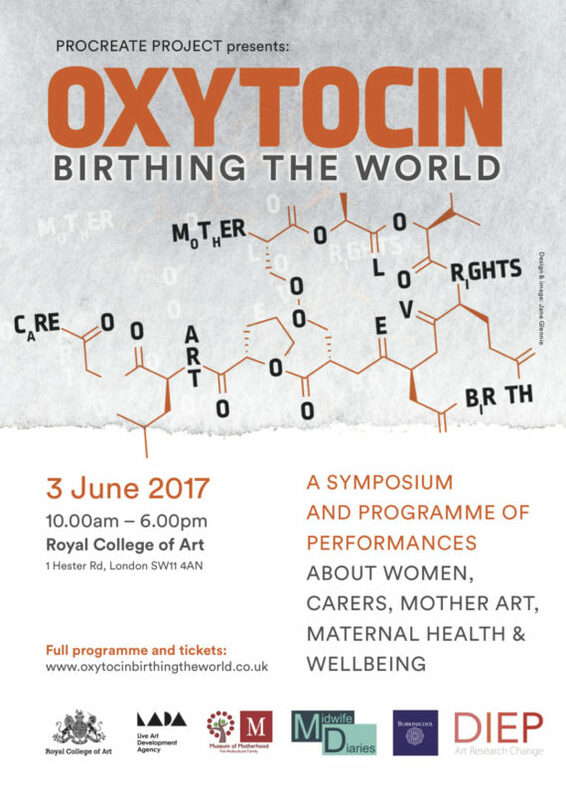 Oxytocin is a one-day symposium and programme of performances about women,carers, mother art, maternal health & wellbeing. Supported by LADA and under the umbrella of the Procreate Project, the event is curated together with Dyana Gravina form the Procreate Project, Martha Joy Rose from the Museum of Motherhood (USA), Laura Godfrey-Isaacs, artist, midwife and founder of Home Live Art, Sara Paiola, researcher in Law and Human Rights from the School of Law, Birkbeck University and Sarah Dufayard, artist and producer. Oxytocin is an international research and community event focused on mothers and carers. The panels will analyse current critical practices pushing for new strategies aimed at increasing the visibility and representation of women and mothers in society. The event will consist of panel discussions lead by three sectors (Artists & Academy, Midwifery, Mental Health and human rights) fused with a day programme of performances, installations and live art. Martha Joy Rose: founder, and director of the Museum of Motherhood (USA) is a feminist, activist pioneer in the mother-made arts movement. Identifying a need for maternal perspectives within the educational and cultural landscape, she believes that exploring the art of motherhood is the logical expansion of feminist articulations. Laura Godfrey-Isaacs, is an artist, midwife and feminist academic and activist who founded the live art and performance company www.homeliveart.com She is currently exploring the creative, research, academic and activist possibilities of bringing interdisciplinary and arts-based approaches into midwifery. Sally Marlow: PhDNational Addiction Centre, Institute of Psychiatry, Psychology and Neuroscience. King’s College London. Her research includes looking at substance use in mothers, and how badly systems and services are set up to support mothers with substance use problems. Part of that work has focussed on mental health problems commonly found in these mothers, along with factors such as domestic violence. more speakers and performance artists will be annouced soon.